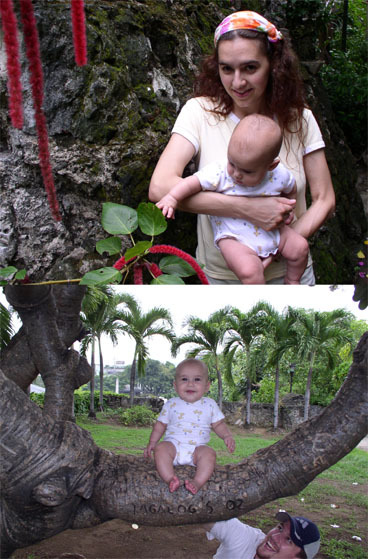 7/1/2005 - Good-bye, Manila! Hello, Cebu! We finally made it out of Manila. We're enjoying the change,although we do miss the pollution, heat, traffic, insane taxi drivers,and the booming karaoke machine next door. We'd given up writing for afew weeks, because we were in Manila and depressed enough to not be atthe beach without writing about it. But Tony has now successfullyfinished his study and we're free to take a much-needed vacation fromour vacation. Sarah enjoys writing these missives so much that Tonyand Axa have deferred, but Tony chooses and edits the pictures, andAxa helps out by rendering it impossible for pictures and letter to beworked on simultaneously. Tony is still deciding whether he wants tokeep his goatee or graduate when we return to BYU. 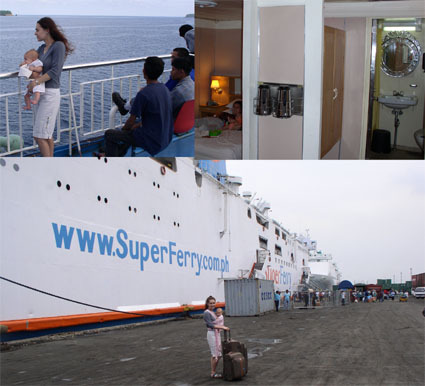 Rather than flying to Cebu, we decided to take the Superferry. It wasa 24-hour mini-cruise, which we enjoyed immensely. We booked Suiteroom#1, where we drifted off to sleep, rocked by the gentle movement ofthe waves. We spent our time watching the little islands of theVisayas drift by and dreaming of white-sand beaches. We arrived in the port at Cebu City on Wednesday and stayed the nightat ACE, the Academy for Creating Enterprise (a school that teachesfilipino returned missionaries basic business skills). 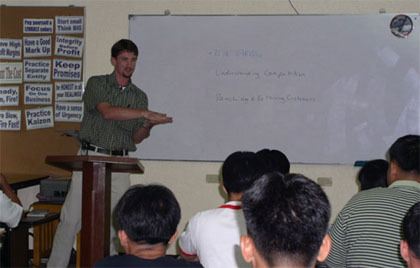 In the morning,Tony gave a presentation about his research to the students. 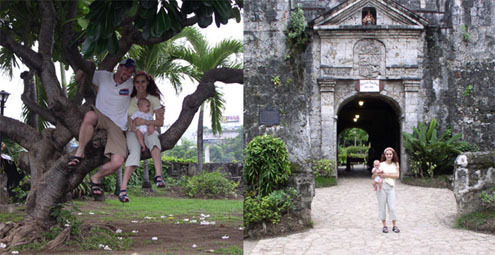 We spentthe afternoon visiting historical sites in Cebu City. Our first stopwas the Basilica Minore of the Santo Nino, the oldest Catholicartifact in the Philippines. He is a royally dressed little statue(duplicated in miniature in hundreds of taxis throughout the city) inan ancient stone church that has burned three times in its fivehundred year history (it is currently undergoing another renovation).Right down the street from the Santo Nino is Magellan's Cross, plantedwhen he first set foot in the Philippines and claimed it for Spain. 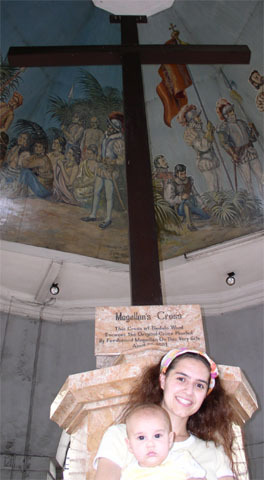 Hehad later difficulties in the area,culminating in his plan to impress the local tribal leader, Lapu-Lapu.Magellan hired a thousand Cebuano mercenaries and set off to attackLapu-Lapu with some sixty of his own troops. He underestimated his foeand told the thousand Cebuanos to stand back and watch as he stoodagainst Lapu-Lapu with only his own men. When Lapu-Lapu failed toflee, the Spanish beat a hasty retreated to the boat. Ponderouslybacking away in his heavy armor, Magellan was wounded in the foot by awell-placed poisoned spear. He had to be unceremoniously carried backto the boat, where he died of several wounds, the largest having beeninflicted on his pride. Lapu-Lapu became a national hero, and had thenational fish named after him. Our last stop yesterday was Fort San Pedro, a nicely-preserved bastionof Spanish rule in Cebu. Originally erected of wooden spikes in the1500's, it is now a massive 18th century stone structure, but housesonly a lovely garden and some well-fed pigeons. We arrived too late tosee the museum that houses booty from a sunken Spanish galleon, buthope to see it sometime later when we return to Cebu. We started off today with a tour of the Butterfly Sanctuary, actuallyhoused in the residence of the late Professor Julian Jumalan. 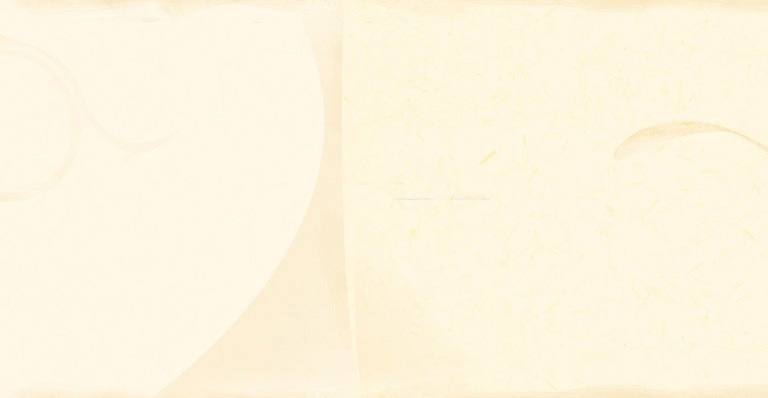 Hispassion was butterflies, and he collected them, both in intact andfragmentary form. The latter he turned into fabulous mosaicscompletely composed of butterfly wings. We've enclosed a potrait-mosaic of Lapu-Lapu with a detail shot so youcan see the unique texture. Each mosaic has a matchingwatercolor painting, since the professor was also an accomplishedpainter. 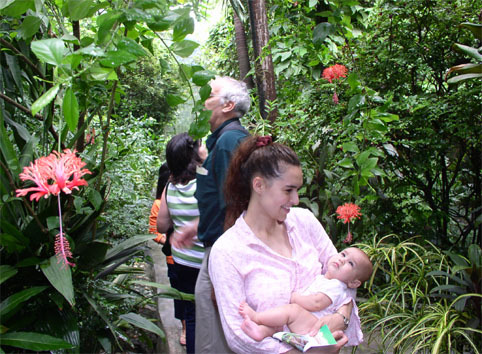 He collected butterflies and various oddments from around theworld, and his collections (ranging from insects to coins to musicalinstruments to cheap tacky souvenirs) reside in a charming littlehouse with, of course, a beautiful and fairly extensive tropicalgarden inhabited by a community of butterflies. We arrived on a fairlywet day (the rainy season has begun in force), so only a fewbutterflies were out, but we did see representatives of each stage inthe life-cycle, including a female butterfly flitting from leaf toleaf and laying an egg on each one. Our companions on the butterflytour were a nice Australian couple who came to have dental work donein the Philippines and were kind enough to drop us off downtown afterthe tour. 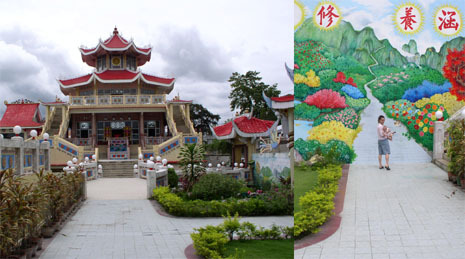 Cebu has a number of beautiful Chinese temples, representative of themany Chinese-Filipinos. We took a snazzy purple jeepney up to thePhilippine-Chinese Religious Center, a charming little place with cheerfulmurals on every wall and lovely tiered gardens watched over by a dozenor more dragons. 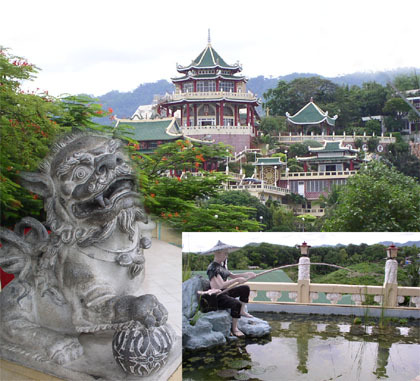 Another jeepney ride and a nice, uphill walk through"Beverly Hills" of Cebu brought us to the hilltop Taoist Temple, adramatic affair overlooking the city and the bay. From the top, wecould see what looks like another ornate religious edifice, but isactually the Casino Filipino, which could compete with the most garishofferings in Las Vegas. Tomorrow we leave for Bohol so another letter should be shortlyforthcoming. Take care everyone. We are excited to see you again whenwe come home.